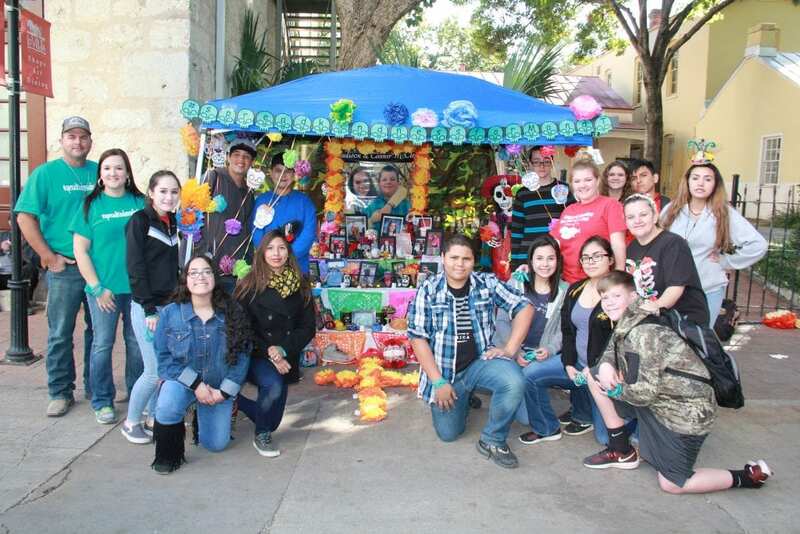 The Jourdanton HS Spanish Club created an altar for the Dia De Los Muertos Fest held at La Villita in San Antonio. They chose to honor the memories of Madison and Tanner McCleary and also promote the #SpreadKindnessForMandT movement. The students were also joined by Madison and Tanner’s parents Kevin and Audrey McCleary who were kind enough to share personal effects of their children with the Spanish Club for the altar. The students also shared the McCleary children’s story and passed out over 1K teal bracelets. The club earned the festival’s Fan Favorite award for garnering over 400 online votes and won a cash prize. Pictured are: Kevin McCleary, Audrey McCleary, Adria Moore, Dante Sloat, Nicholas Rodriguez, Chelsea De La Garza, Olivia Elizondo, Ethan Vrana, Julia Williams, Jordan Wallace, Eric Alvarado, Zenaida Martinez, Bryan Rodriguez, Belinda Reyna, Analicia Vallejo, Cade Brenegar and Gabriela Garcia (Spanish Teacher).